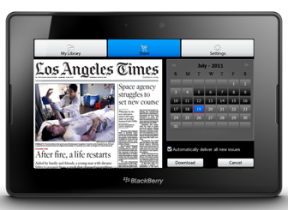 RIM’s BlackBerry PlayBook tablet computer will soon come pre-loaded with PressReader, a digital news app from a company called NewspaperDirect. The application offers one-click access to more than 2,000 ‘replica’, full-content newspapers from close to 100 countries. According to NewspaperDirect, news publications often hit PressReader before they hit the newsstands in their local markets. Some of the daily newspapers that will be available: Chicago Tribune, Daily Mail, International Herald, Irish Times, La Presse, La Tribune, Le Monde, The Australian, The Guardian, The Globe and Mail and The Washington Post. Most individual newspapers and magazines available through PressReader can be purchased for $0.99 per issue, or downloaded in conjunction with a paid subscription on PressDisplay.com. PressReader is also available for iPhone/iPad, Android phones and tablets, and Windows 7 slates.